Earth Day is almost over, but I thought this painting is a good one for it. I usually just draw/paint animals, but I’ve been trying to create more landscapes/scenes. Drawing/painting landscapes/scenes isn’t really my thing, but, it doesn’t mean I can’t add an animal or two into the scene. This tree in the painting is one that is near my house that I often walk by. I love its gnarly branches and shape. Also, it has a big hole in it. Amazing that it is still alive with that… though, in this painting it is winter. 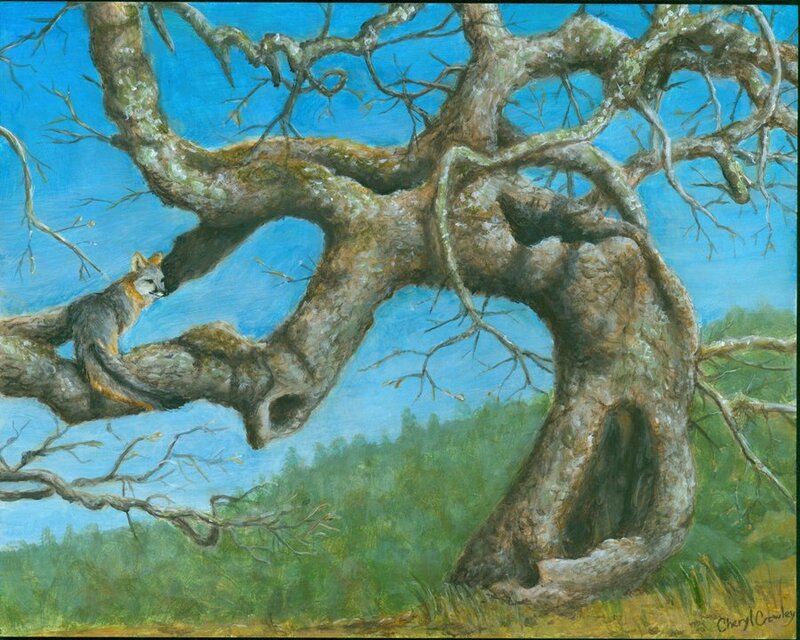 Now, I haven’t seen the gray fox on this tree, but I do know that they can climb trees. Foxes are really the cat-like canine. The gray fox is quite a good climber. I almost missed the fox, it looks like part of the tree at first glance. Pretty painting though, trees are fun to draw/paint.